I'm not sure it would be wise to draw attention to George Orwell with a meme for the FES. 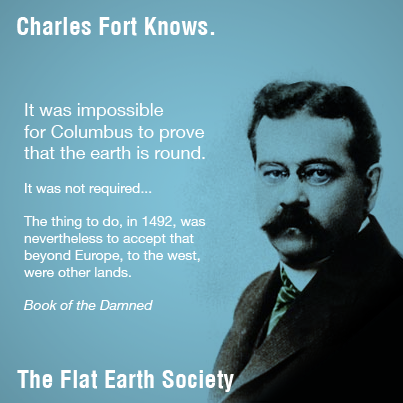 As for the Flat Earth theory, I believe I could refute it. If you stand by the seashore on a clear day, you can see the masts and funnels of invisible ships passing along the horizons. This phenomenon can only be explained by assuming that the earth’s surface is curved. He was actually saying that one didn't need to be an astronomer to ascertain that the world was spherical: It was obvious to any layman. 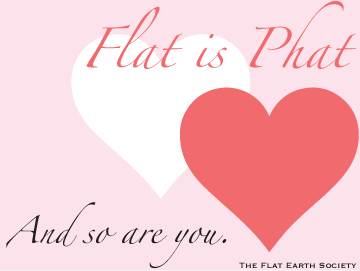 Yes, one does not need to be an astronomer to ascertain the worlds shape, flat or round. That was the point of the meme. Is that lost? I figured it would come up with the context of the set. Perhaps you are right though. His proof, however, is as silly as most others. Such things are clearly outside his skillset. Perhaps you are right though. His proof, however, is as silly as most others. Such things are clearly outside his skillset[sic]. Really? And what is your skill-set? How are you more qualified than Orwell to assert your observations as truth? He doesn't assert observations as truth, but instead his explanation of observation as truth. I wouldn't say either of us (or any of us) are particularly qualified to make such assertions to "truth". However his is an example of tunnel vision. The sinking ship phenomena has been modeled in several coherent ways. EA, Relativistic FET, Parallaxian Perspective, and relative wave sizes all come to mind. John Davis would say this is all nonsense. What ever happened to him? I hope he returns. i was just swallowing it whole no problem. Sine scientia ars nihil est. 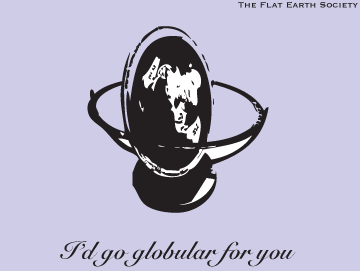 "I'd go globular for you" - No one receiving that one would believe it. i hope John Davis returns, now that Willmore has forsaken us. 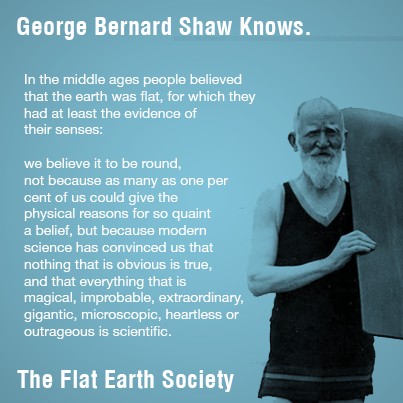 They should also put in there that Stephen Hawking and Aristotle believed that the Earth was round. It is so fun educating FE'rs who don't know anything. 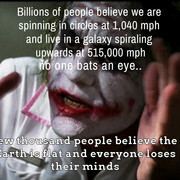 "..and the weather patterns on the moon"
All died. 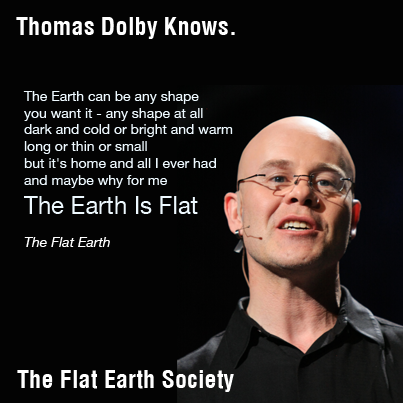 Except Thomas Dolby and people in the China. 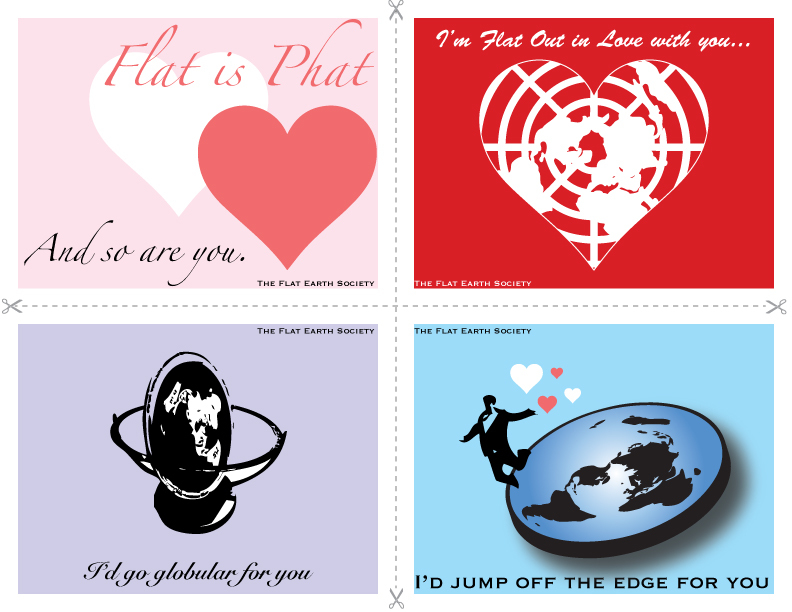 As for the Flat Earth theory, I believe I could refute it. If you stand by the seashore on a clear day, you can see the masts and funnels of invisible ships passing along the horizons. 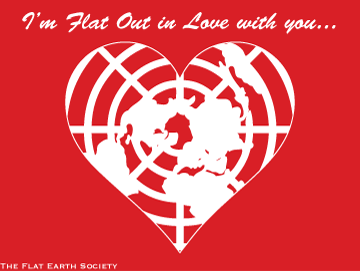 This phenomenon can only be explainedy by assuming that the earth’s surface is curved. Actually it's the way your brain preserves shadows & interprets colours that gives the appearance of a ships hull disappearing over the horizon. There is no curvature only your brain perception misinterpreting. If you would like a demonstration I will try & find you one on YouTube if you like . National geographic produced a hour programme call test your brain . With excellent demonstrated examples on the subject . Not just theory. When it comes to Jane's standards .I'm lower then an old stove she has in her garage. 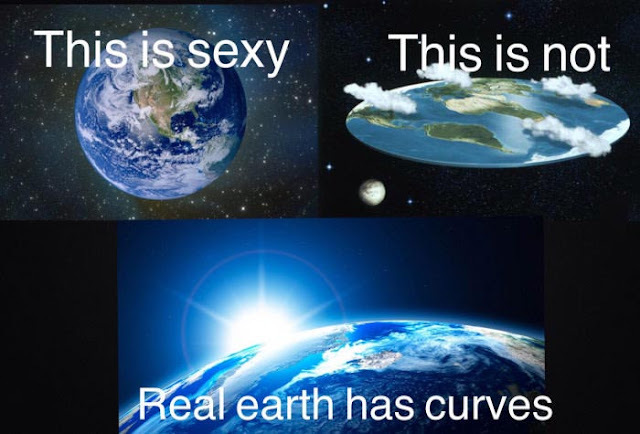 There is no curvature only your brain perception misinterpreting. If you would like a demonstration I will try & find you one on YouTube if you like. National geographic produced a hour programme call test your brain. With excellent demonstrated examples on the subject. Not just theory. Thanks Charles. I'd appreciate it. 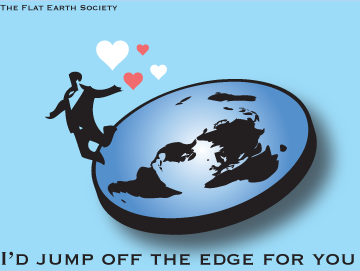 A reminder that Valentine's Day is less than 2 weeks away (remember mailing time?). A Big Thank You goes out to J Davis for making these available. For young and old and in-between. For home, school or work...your card shopping is done. 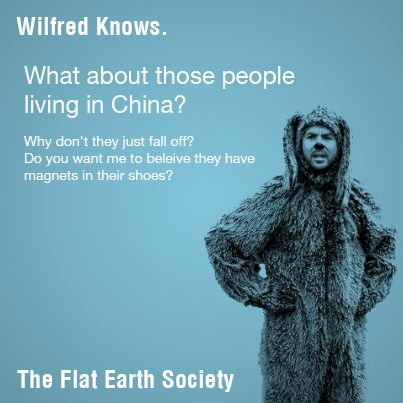 You do understand that this bit from Wilfred is *satirizing* people who believe that the Earth is Flat. Even most young schoolchildren know that there is no gravity in space, no up or down, so nothing would be pulling people in the Southern Hemisphere down off of the planet. But the joke is that Wilred is kinda dumb. 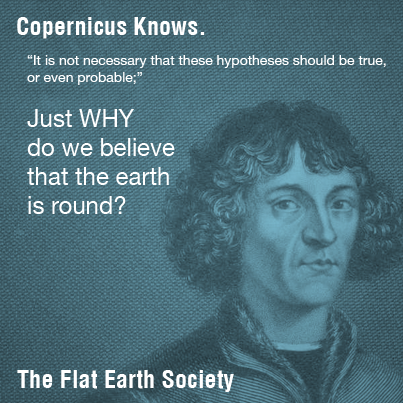 Copernicus and Descartes are talking about whether the sun or earth is the centre of the solar system, not the shape of the earth; everyone knew the earth was round back then. 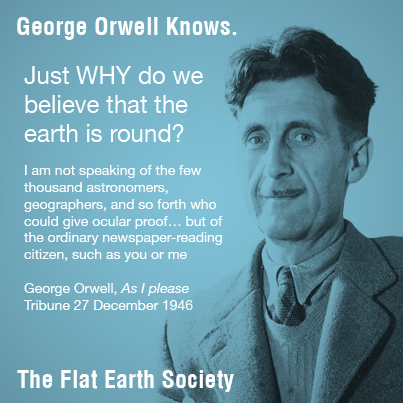 the earth is round in my sig to answer Orwell's question. You have got to be joking with the Wilfrid one, but some people here have said the same thing. Four of them are misleading quotes, wouldn't be uprised if more were. Are you deliberately trying to mislead people? You really should remove the Goethe one, WTF has colour theory got to do with anything here! 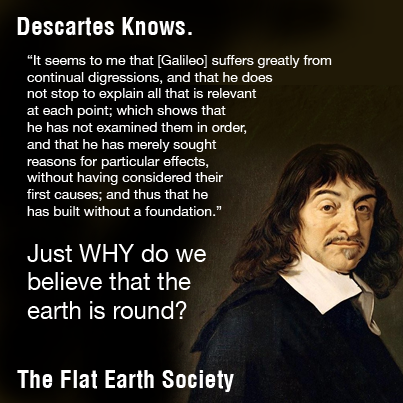 What is the context of the Descartes quote, because I bet it has nothing to do with the earths shape. 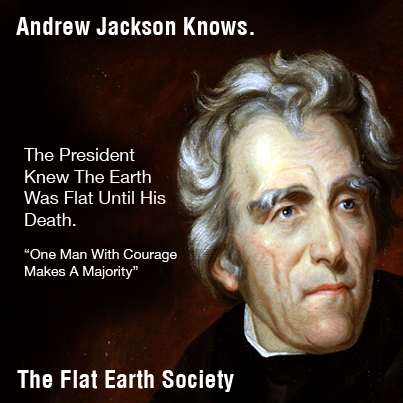 To fall into the belief of a flat Earth is to deny YOUR OWN cognizance. I have tried to find where the quote comes from, I can't find its source, but it was likely referring to their different positions on metaphysics. In lieu of a suicide note, I'm just gonna print these out and leave them around the room. 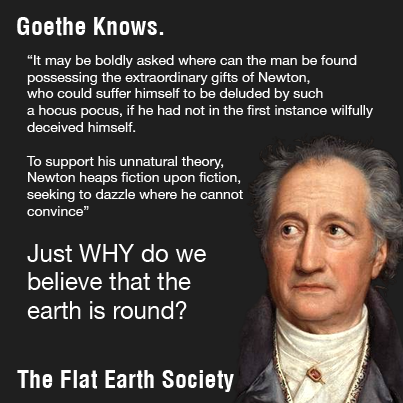 The Earth is flat, therefore God is real. Nice work with those memes George Orwell was one of the most intelligent and logical thinking people ever (in my opinion). Here is what I think about his quote: I think that he wanted to point out, that first-hand evidence and first-hand knowledge is what counts. Therefore and because I believe in pragmatical thinking, I like his quote best. Why did you include Jackson at all?? You didn't even include an out of context quote you could exploit.